PASTOR DAVID YONGI CHO (Yoido Full Gospel Church, Seoul South Korea) Pastor David Yonggi Cho is the founder of the Yoido Full Gospel Church, the world’s largest Pentecostal Megachurch . The church was founded in Seoul, Korea, on May15, 1958, by Pastor Cho and his mother-in-law, Choi Ja-Shil . What started as a house church with four members has now grown into the largest congregation with church membership of about 1 million. Throughout Pastor Cho’s ministry, he emphasized the importance of cell group ministry, which he believes is the key to church growth. His passion for the teaching and propagation of the gospel led him to establish many organizations most notably, Church Growth International (founded in November,1976), an organization dedicated to teaching the principles of evangelism and church growth to pastors all over the world. He also founded Elim Welfare Town (January 1986 ), a facility for the elderly, the young, the homeless, and the unemployed. Pastor Yonggi Cho also established Hansei University (founded in March, 1986), an institution dedicated to training students for academic and spiritual success, and to participate in world evangelism. DAG HEWARD-MILLS (Lighthouse Chapel International, Accra Ghana) Dag Heward-Mills, singularly forged by the fire of the Word of God, has his eyes burning with a vision for the Body of Christ that shall impact the entire world. He is a dynamic apostle, evangelist, pastor, teacher, and prophet. His teachings and books show God’s power and truth working in his life and the lives of others. PASTOR W.F. KUMUYI (Deeper Christian Life Ministry, Lagos Nigeria) In 1973, while serving as Math Lecturer at The University of Lagos, W.F. Kumuyi started a Bible study group with 15 university students who had come to him requesting training in the Scriptures. By the early 1980’s that small group had grown to several thousand, at which time Deeper Life Bible Church was formally established. By 1988 the congregation had grown to 50,000, and now numbers 120,000 members, making it the third largest Christian church in the world. The Deeper Life Bible Church not only has an attendance of 120,000 every Sunday, but has planted 500 churches in Lagos, 5,000 in the rest of Nigeria (with an independent estimate of more than 800,000 members in Nigeria alone), and 3,000 elsewhere (with missionaries to 40 countries of Africa) as the movement missionary contribution. STEVE MURRELL (Victory Metro Manila, Manila Philippines) Steve and his wife Deborah went on a mission trip to Manila, Philippines during the summer of 1984. He says they were idealistic and unprepared for what was in store. What they thought would only be a one month stay has become 28 years of ministry and the founding a church that has grown from the city where it began, to the rest of the country, and to other nations. That mission trip consisted of sixty-five American university students evangelizing in Manila’s University Belt, or U-Belt. After two weeks of meetings at an auditorium the new church, called Victory, moved into the basement of a large theater. This congregation of about 165 high school and university students from Manila’s U-Belt has grown to more than 52,000 students, professionals, and families who now worship in multiple venues around Metro Manila. Victory has equipped and empowered over 3,500 small group discipleship leaders who meet weekly in coffee shops, homes, offices, and shopping malls all over the city for Bible study, prayer, and fellowship. DAVID OYEDEPO (Living Faith Church (Winner’s Chapel) David O. Oyedepo, (born September 27, 1954) is a Nigerian Christian author, preacher, the founder and presiding Bishop of Living Faith Church World Wide, also known as Winners Chapel, and its affiliated international churches known as Winners Chapel International, with headquarters in Ogun State, Nigeria. Oyedepo is the senior pastor of Faith Tabernacle, a 50,000 seat church auditorium, reported to be the largest church auditorium in the world by the Guinness Book of Records The Winners Chapel network of churches is located in over 300 cities, in all states of Nigeria, as well as, in over 63 cities in 32 African nations, Dubai, the United Kingdom and the United States. Oyedepo has been seen as one of the pioneers of the Christian charismatic movement in Africa and has been referred to as one of the most powerful preachers in Nigeria. JOSIAH OLUFEMI AKINDAYOMI (Redeemed Christian Church of God, Lagos Nigeria) Josiah Olufemi Akindayomi was the founder and first general overseer of what is today known as the Redeemed Christian Church of God. 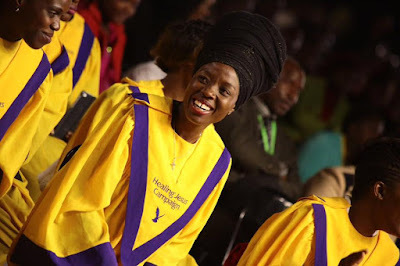 The church, today acclaimed as the fastest growing Pentecostal church in the world, started in 1947 as an independent prayer fellowship, the Glory of God Fellowship. This group blossomed into the Redeemed Christian Church of God in 1952. Josiah was born in 1909 into the Akindayomi family in Ondo State, Nigeria and died in 1980 at the age of 71. Thereafter Pastor Adeboye’s appointment was formalized and he has since been the general overseer of the church. Today God is still doing powerful work through the Redeemed Christian Church of God worldwide. In 1981 there was an explosion of growth in the number of parishes. At the last count there were about 2,000 parishes of the church in Nigeria. The church is also present in other African nations, Europe the Americas, and in the Caribbean. RAY MCCAULEY, (Rhema Bible Church, Johannesburg south Africa) McCauley attended Bible College at Rhema Bible Training Center in Tulsa, Oklahoma during 1978/9. On his return to South Africa started Rhema Bible Church under Rhema Ministries SA in the home of his parents, Jimmy and Doreen, which 13 people attended. Membership grew and the church moved into the former Constantia Cinema in Rosebank, Johannesburg. The church outgrew its premises and moved to a warehouse in Jan Smuts Avenue in Randburg before moving to its current premises. In 1985 the church moved into the newly constructed 5,000 seater auditorium in Randburg, Johannesburg. The new church was dedicated on 16 June 1985 by Dr Kenneth E Hagin, the late founder of Rhema Ministries in Tulsa, Oklahoma. The auditorium was later upgraded to more than 7,500 seats to accommodate the growth of the church. Today the church has a 45,000 strong congregation, which is the single largest church congregation in southern Africa. ARCHBISHOP NICHOLAS DUNCAN WILLIAMS (Action Chapel, Accra Ghana) Archbishop N. Duncan-Williams is known in many parts of the world as the “Apostle of Strategic Prayer.” He is the General Overseer of Christian Action Faith Ministries, with over 100 affiliate and branch churches located in North America, Europe, Asia and Africa. He is also the Founder and President of Prayer Summit International. Prayer Summit brings the message and the power of prayer via conferences to many U.S. cities and abroad with its emphasis on corporate prayer, breaking down spiritual barriers that hinder revival in specific cities. Anointed in the ministry of prayer, healing and the prophetic, his teachings have touched countless lives over the past 32 years. His intense passion for intercession and strategic prayer is born out of his personal experience. This Apostolic grace has been recognized and appreciated by all who have been in Archbishop’s company. Archbishop Duncan-Williams has authored several books and can be seen weekly on his television program, The Voice of Inspiration, which is viewed by millions in Europe and Africa. From a Christian family, Alex has been in church from childhood. In a service it was prophesied that he would be the servant of God. In 1965, Alex hit a small child. The little boy was very badly injured and death was imminent. The child’s family threatened to kill him if the child dies. Alex went to a church and pray all night and vowed that he would give up and be a servant of God if the child recovers. A miracle happened and the child did not die but successfully underwent surgery and recovered. Alex gave himself to serve in the church selling his properties and going on to establishing 14 churches and missionary outposts. PASTOR AYO ORITSEJAFOR (Word of Life Bible Church / International Gospel Center, Ajamimogha Warri, Nigeria) Pastor Ayo Oritsejafor is a dynamic preacher. He is a Pastor, Evangelist, Teacher, Prophet, Apostle and an Author, with a unique anointing of God upon his life. In 1972, the Lord saved and miraculously delivered him during a crusade. Almost immediately, he felt the call of God upon his life and enrolled in the New Covenant Bible Institute, Benin City, Nigeria. While in college the Lord showed him a vision of himself preaching to countless thousands of people with great power and authority and he heard the Lord say “Take my Word to the World”. He is currently the national president, Penticostal Fellowship of Nigeria (PFN) and president, Christian Assosciation of Nigeria (CAN). DR. DAVID A. SOBREPEÑA (Word of Hope Christian Ministries, Quezon City Philippines) In August 1988, in response to a vision and call from the Lord to start a ministry in his homeland, he planted a church with three people, which would become WORD OF HOPE CHRISTIAN CHURCH. Strategically located at, it has become an important landmark in the metropolis. Under his leadership the church has experienced tremendous growth. Today, Word of Hope holds the distinction as one of the largest born-again Christian churches in the country. It has over 4,000 Cell Groups (small groups with an average size of 10.2 persons per group), 16 satellites (campus sites) in Metro Manila with 56 Services on any given Sunday, and has planted numerous churches across the country. ALAN PLATT (Doxa Deo, Johannesburg South Africa) Alan Platt is an agent of transformation in the lives of individuals, local churches and corporate structures of society. As the Leader of Doxa Deo, a strong city-reaching strategy has been established. In Tshwane (Pretoria, South Africa) Doxa Deo serves 30000 people in ten different campuses. This Ministry has also established churches in five other cities in South-Africa, as well as three internationally (London, UK: Auckland, NZ; and Stuttgart, Germany). Through Alan’s primary gifting in leadership and teaching, he has not only established an exceptionally dynamic leadership team in Doxa Deo, but he has also influenced a wide spectrum of organizations, denominations and church networks internationally. His influence extends beyond the church to the influencing of the business sector, education and society at large. KONG HEE (City Harvest Church, Singapore) Preaching the gospel of Christ in a manner that is both progressive and heartfelt, Kong is a highly sought-after conference speaker worldwide, and his messages reach out to touch and minister to millions of lives through many multimedia platforms. Kong’s revelatory emphasis of the Great Commandment, the Great Commission and the Cultural Mandate resonates powerfully within 21st Century Christianity by inspiring believers everywhere to take on the mantle of Kingdom ambassadorship. Not just within the four walls of the church or within full-time ministry, but in whichever areas of society God has placed them in. REV D MOHAN (New Life Assembly of God, Chennai India) Rev D Mohan is the Senior Pastor and founder of the New Life Assemblies of God whose life and ministry is touching thousands of lives. Faith in God and relentless prayers were the two most important factors that went a long way in establishing this Church. Passion for this blessed ministry along with the abundant mercies from the Lord helped him to fulfill this God given mission. Rev D Mohan commenced his Christian journey in 1968 when he was just 21 years old. Having completed his graduation, he went on to do his theological studies at Southern Asia Bible College (SABC) in Bangalore.Alongside his theological studies, he had the opportunity to pastor a small church in Bangalore.Around this time, he was blessed with his beloved wife who has partnered with him for this great vision. During the initial years of his ministry, he did have distressing times but God’s harmony and peace was upon his life. All through his ministry, Rev Mohan knew that as long as he stayed under God’s guidance, God would fulfill his promise. Thus the church, which had a humble beginning, grew from 7 people to 30000 people as the Spirit of the Lord moved mightily. Relentless prayers, faith and effective partnership have been instrumental in establishing this church. BRIAN HOUSTON (Hillsong Church, Sydney Australia) As a leader, Pastor Brian Houston is highly regarded for his boldness, innovation and vision. As a church pastor, he is well respected for his passion for the cause of Christ and the local church, and for preaching messages that change mindsets and ministries. But at home – Hillsong Church – Pastor Brian is most loved for being the ‘dad of the house’ – a pastor who loves God and people, and a speaker of life who declares, ‘The best is yet to come’. “We planted the church by starting a Sunday night outreach. The very first Sunday we had 70 people turn up. The second week, there were 60, the third week, 53, and by the fourth week, 45. I’ve often joked that we worked it out at the time- we had only four and a half weeks left until there were no more people. It was about that time that we had our first ever commitment to Christ. We outgrew the school hall after 12 months. The crowds were so big that we were using road-case as the platform, and what should have been the stage as a balcony so that we could fit more people in.” – Brian Houston. The congregation outgrew the warehouse. The Hills Centre had just been completed and became the home of Hills Christian Life Centre for the next 6 years. During this time the influence and strength of our church began to be felt through our praise and worship. WILLIAM HYBELS (Willow Creek Community Church in South Barrington, Illinois) William Hybels (born December 12, 1951) is the founding and senior pastor of Willow Creek Community Church in South Barrington, Illinois, one of the most attended churches in North America, with an average attendance of nearly 24,000 as of 2011. The church has been listed as the most influential church in America for the last several years in a national poll of pastors. He is the founder of the Willow Creek Association and creator of the Global Leadership Summit. Hybels is also an author of a number of Christian books, especially on the subject of Christian leadership. CRAIG GROESCHEL (Lifechurch.tv, Edmond Oklahoma, United States) As the Senior Pastor of LifeChurch.tv, Craig provides leadership and guidance for the church as a whole. Following a vision God gave him for a different kind of church, he and a handful of people launched LifeChurch.tv in 1996. ED YOUNG (Fellowship Church, Grapevine, Texas) Ed is the founding and Senior Pastor of Fellowship Church. In addition to the main campus in Grapevine, Fellowship Church operates five more satellite campuses in the greater Dallas/Fort Worth area, two in Miami, FL, and a location in London, England. Ed Young is a pastor, author and conference speaker noted for his creative communication style. He has a passion for making the complex, simple as he speaks truth to people in ways they can understand and apply to their everyday lives. Ed has been married to his wife, Lisa, for more than thirty years. They have four children and live in the Dallas/Fort Worth area. RICK WARREN (Saddleback Valley Community Church, Lake Forest, California) Rick Warren was born in San Jose, California and earned a Bachelor of Arts from California Baptist University, a Master of Divinity from Southwestern Theological Seminary, and a Doctor of Ministry from Fuller Theological Seminary. He and his wife Kay founded Saddleback Church when he was just 25 years old and he continues to serve as the senior pastor. He is the author of the bestselling book The Purpose Driven Life. To many, he is Pastor Rick, but to his church, he is Papa Rick—a voice of wisdom, hope, encouragement, and vision. Since founding Saddleback Church 33 years ago, Pastor Rick has become one of the nation’s leading pastors. He mentors young leaders, and many of today’s leading pastors credit him and his book The Purpose Driven Church for inspiring them to pursue their own callings to ministry. He has trained over 400,000 church leaders from 163 countries on the Purpose Driven principles of church health and balance. Pastor Rick also founded Pastors.com—an online interactive community that provides sermons, forums, and other practice resources for pastors. BISHOP T.D. JAKES (The Potter’s House, Dallas, Texas) Bishop T. D. Jakes is a charismatic leader, visionary, provocative thinker, and entrepreneur who serves as senior pastor of The Potter’s House, a global humanitarian organization and 30,000-member church located in Dallas. Named “America’s Best Preacher” by Time Magazine, Jakes’ voice reverberates from the world’s most prominent stages. Through his nexus of charitable works, T.D. Jakes is known for extending a hand of help to the needy, heart of compassion to the hurting, and message of inspiration to the disenfranchised. MOSA SONO (Grace Bible Church, Soweto South Africa) Bishop Mosa Sono is Founder and Senior Pastor of Grace Bible Church which was established in September 1983. His calling and passion is to win people to Christ, bring believers into full maturity of their walk with God, train, raise and mentor leaders in the church, corporate sector and in the community at large. Bishop Mosa Sono has a passion for the local church. He believes that “the church is the hope of the world” and that the church needs to align itself with Christ’s mission to preach the gospel to all and win people to Christ, to be the extension of God’s love in ministering to the pain and hurt of it communities and to build “prevailing” churches. Grace Bible Church hosts an annual Good Friday program at the stadium, targeting a mass harvest of people into God’s kingdom. The church also hosts other annual seminars on Leadership, Church Planting, Cell groups and Business Leadership. Another annual event that Grace Bible Church has is “Word Explosion” which is a 3 day celebration that usually starts on Friday and ends on Sunday every September.